Open House was launched in 1992 as a not-for-profit organisation dedicated to promoting public appreciation of the capital's building design and architecture. The intention is to open up London's splendid buildings to members of the public who wouldn’t otherwise have access, helping them to become more knowledgeable on architecture and enable them to make informed judgements on its future. 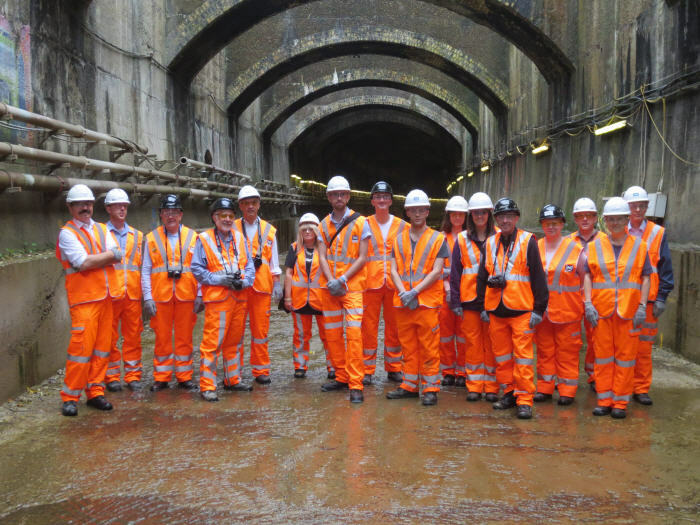 Project Manager Paul Osborne was the host and guide, providing three groups of visitors with a site office briefing, before kitting them up in Personal Protective Equipment (PPE) for a walk through the tunnel. A total of 40 members of the public took part, having been chosen from over 500 applications. The Victorian-built Connaught Tunnel is a brick-arched structure lying beneath London’s Royal Docks. Constructed in 1878, its refurbishment forms part of the Crossrail project and will renew its life for another 120 years. The Open House concept has become so successful it has spread to almost 20 cities worldwide, including New York, Dublin, Jerusalem, Helsinki, and Melbourne. Crossrail Ltd appointed Taylor Woodrow to upgrade two kilometres of existing disused running line from the DLR Custom House station to the North Woolwich Portal. The four year project is part of a southeast spur of the Crossrail scheme and is expected for completion in May 2015.